In food processor, place Olive Spread ingredients: roasted red peppers, pickled vegetables, Calamata olives, green olives, artichoke hearts, capers, parsley, garlic, Italian seasoning, black pepper and olive oil. Chop by pulsing until consistency of cole slaw. Marinate for at least 30 minutes at room temperature. Prepare gas or charcoal grill, or preheat broiler. Place chicken breast halves between two pieces of wax paper; pound gently to ¼ inch thickness. Brush each side of chicken with vegetable oil; season with salt and pepper. Grill or broil for 2 to 3 minutes per side, until cooked throughout. Assemble sandwich by opening bread and drizzling each half with olive oil. 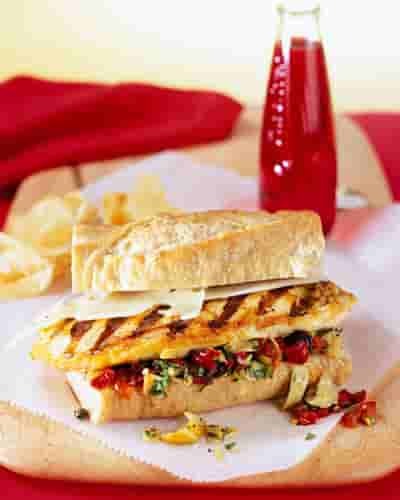 Spread ½ cup Olive Spread on bottom of each sandwich; top with grilled chicken and one slice of Swiss and one slice provolone cheese. Recipe and photo courtesy of the National Chicken Council and the Culinary Institute of New Orleans, Louisiana. Used with permission.